Back last summer we heard word of Sustainable Sites Initiative (SITES), a new certification program that would do for landscapes like LEED has done for buildings. 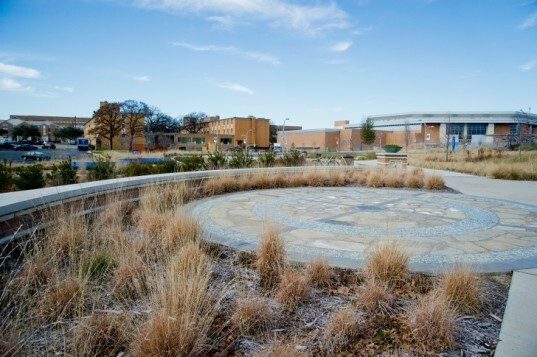 The program has just awarded certification of its first landscape to a new park at the University of Texas at Arlington, making it one of the first certified SITES. 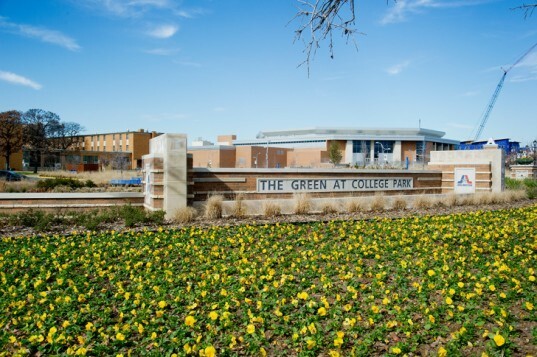 The Green at College Park was designed by Arlington-based Schrickel, Rollins and Associates in collaboration with the architect department at UTA. The 2.6-acre park is located on the south side of College Park Center and works to infiltrate stormwater form the surrounding campus, makes use of sustainable materials, efficient lighting and water efficient irrigation. We tracked down the lead project designers and asked them to give us the low down on what it took to get a SITES certification. 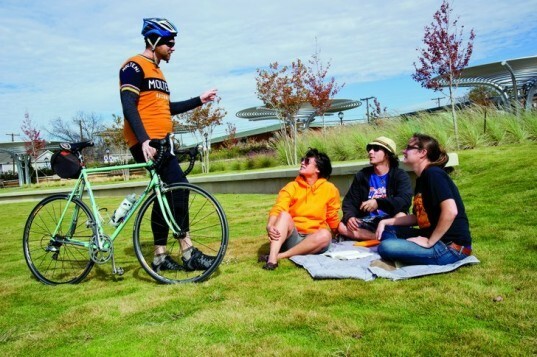 The Green at College Park is a sustainable landscape that sits adjacent to the LEED Gold certified College Park Center at UTA. 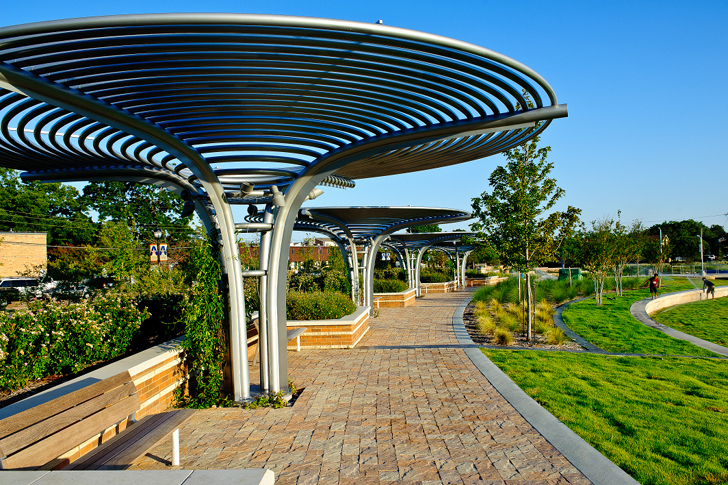 The arena was designed by HKS Architects, while the surrounding park was designed by Schrickel Rollins with the help of landscape architects and professors from UTA. The park works to decrease stormwater runoff from the College Park Center. The park also features the use of locally-sourced building materials, energy efficient lighting, and water efficient irrigation systems and landscape design to reduce potable water use by 63.7%. Since SITES is still a very new program, we wanted to find out more about the standards and the certification. We tracked down the lead architects and designers to ask them what it was like to get a SITES certification and what they learned from it. From HKS Architects, we spoke with Ellen Mitchell, AIA, LEED AP BD+C, and HKS’s Design Green manager. Then we heard from the project lead at Schrickel Rollins, Janna Tidwell, R.L.A., ASLA Associate. And finally we heard from David Hopman, ASLA, PLA Associate Professor and Landscape Architect from the University of Texas at Arlington. David and a university research associate named Sonal Parmar worked with the architects at Schrickel Rollins to determine how Schrickel Rollins’ design of the park fulfilled SITES requirements and compiled the proper documentation of the project. INHABITAT: How does the SITES certification go above and beyond the regular LEED certification? Ellen Mitchell, HKS’s Design Green Manager: The SITES certification exemplifies UTA’s commitment to sustainability which is carried out beyond the built environment and into sustainable land management. While the initiatives of the SITES program are not currently accounted for in the LEED rating system, the United States Green Building Council (USGBC) anticipates incorporating some of these guidelines and performance benchmarks into future iterations of LEED. Janna Tidwell, Schrickel Rollins & Associates: Prior to SITES, it was almost impossible for a project without a building to achieve a nationally recognized sustainable rating. SITES provides additional guidelines and measures to sustainably guide the development of a site and acknowledges those projects that meet the criteria through its nationally recognized rating system. It is now possible for a “non-building” project to be recognized for its sustainable achievements. Projects that do contain buildings will also benefit by meeting the increased criteria applied to the site. INHABITAT: In terms of measurable impact, what does the SITES certification mean for The Green at College Park? Ellen Mitchell, HKS’s Design Green Manager: To be in compliance with the SITES initiatives, the Green at College Park had to rely on a palette of native North Texas plant species that could withstand both periods of heat and drought as well as possible flooding due to the intentional site. One direct benefit of using native and adaptive plants was a 62% reduction in potable water needed for irrigation. INHABITAT: For this specific project, what strategies did you work on to get the SITES certification? Janna Tidwell, Schrickel Rollins & Associates: Although there were numerous strategies addressed to achieve SITES certification the most significant for this project is the management of storm water and creation of habitat and plant biomass. From the beginning of the project the landscape architect was intrigued with an eroded drainage channel that flanked the western edge of the site. A drainage area map, developed by the team, revealed 1/3 of the campus drained into this channel. To preserve the land to be used by people and avoid piping and draining all of the run-off into nearby Johnson Creek, a water body known for severe flooding, the project designer challenged the team of landscape architects and engineers to turn the channel into a site amenity that manages storm water. The entire design of the site revolves around where a drop of water falls and how it is managed across the site. Soil and vegetation work together to increase infiltration, filter out pollutants and serve as a dynamic garden to be enjoyed. 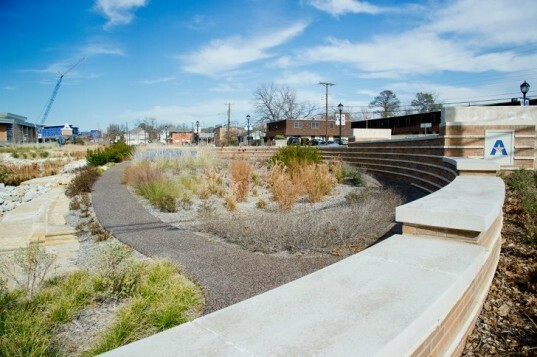 Janna Tidwell, Schrickel Rollins & Associates: In the past many have thought the development of rain gardens and passive storm water management systems in North Central Texas was impossible because of the highly plastic clay soils predominate in the region. The Green at College Park is a working example of how projects with these types of soils can be developed sustainably. It is our hope that this rating draws attention to attention and inspire projects that manage storm water and serve as an amenity for people to enjoy. David Hopman, Associate Professor at UT At Arlington: The Sites certification shows the design team and client what was done correctly and where future projects can improve relative to the performance benchmarks of the 9 categories in SITES. It elevates the thinking of the entire project team. For example, the biomass density index was not on the radar of most of the stakeholders before certification. The Green worked the project “backwards” by certifying a project that was already designed. The strength of the certification is proscriptive and will be very important on the design and construction process of future projects. SITES will also help the College Park Center (coliseum) achieve LEED Gold certification. INHABITAT: What did you team have to do to become knowledgable on the rating system? Janna Tidwell, Schrickel Rollins & Associates: Our project was unique in the fact it was designed prior to being accepted in the pilot program so our team had to become knowledgeable on the rating system very quickly. Our first step was to review the prerequisites and make sure the project would comply. Next, we evaluated the rating system to ascertain if the project could achieve enough points to receive a certification. As much as we studied the process actually going through the steps and completing the requirements was the best classroom. And what you recommend for other firms wanting to get more involved? SITES is truly a team process. I would recommend holding an initial SITES kick-off meeting at the beginning of a project so all team members have a role in meeting the prerequisites and meeting the criteria they determine applies to their project. David Hopman, Associate Professor at UT At Arlington: When I hired Sonal Parmar in 2009, her first charge, approximately one year before the pilot project phase was to study all the prerequisites and credits. She read all the supporting literature and we discussed what was workable for the UTA campus and the general direction of the SITES project. When the first list of benchmarks and credits were released, I asked her to create a spreadsheet that would tie all the credit and prerequisite information together electronically and that could serve as a shortcut for applying SITES concepts to future landscape development at UTA. By the time we started the pilot project phase, we were very knowledgeable about the criteria for SITES. This was critical because there was no training for SITES as there is for people working to certify LEED projects. INHABITAT: What you recommend for other firms wanting to get more involved? David Hopman, Associate Professor at UT At Arlington: Get someone on board early in the design process that is familiar with SITES. This will make the project more successful from the standpoint of ecological services and human use. Also, add two or so percent to the budget to cover consulting fees. INHABITAT: What did you learn through the SITES certification process for The Green that you will apply to future projects you work on? Janna Tidwell, Schrickel Rollins & Associates: I have made a commitment to start using the criteria developed by SITES as guidelines for development of all future projects. 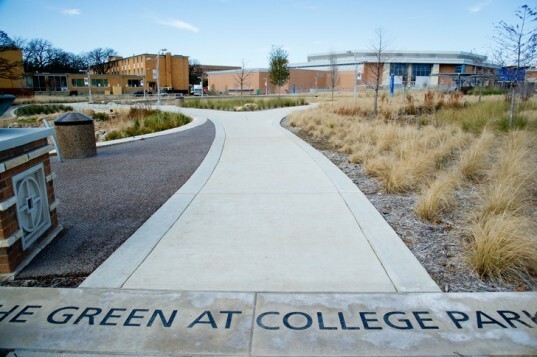 The Green at College Park is a sustainable landscape that sits adjacent to the LEED Gold certified College Park Center at UTA. The arena was designed by HKS Architects, while the surrounding park was designed by Schrickel Rollins with the help of landscape architects and professors from UTA. The park works to decrease stormwater runoff from the College Park Center. The park also features the use of locally-sourced building materials, energy efficient lighting, and water efficient irrigation systems and landscape design to reduce potable water use by 63.7%. Since SITES is still a very new program, we wanted find out more about the standards and the certification. We tracked down the lead architects and designers to ask them what it was like to get a SITES certification and what they learned from it. From HKS Architects, we spoke with Ellen Mitchell, AIA, LEED AP BD+C, and HKS’s Design Green manager. Then we heard from the project lead at Schrickel Rollins, Janna Tidwell, R.L.A., ASLA Associate. And finally we heard from David Hopman, ASLA, PLA Associate Professor and Landscape Architect from the University of Texas at Arlington. David and a university research associate named Sonal Parmar worked with the architects at Schrickel Rollins to determine how Schrickel Rollins' design of the park fulfilled SITES requirements and compiled the proper documentation of the project. The Green at College Park is one of three projects to be the first certified landscape under SITES. The SITES program aims to do for landscapes what LEED has done for buildings. SITES has collaborated with the USGBC to develop their standards and certification program.